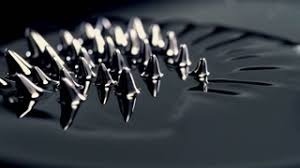 Our Magnetic Density Separation (MDS) technology creates an apparent density range inside a ferromagnetic fluid, enabling multiple density fractions in a single process. 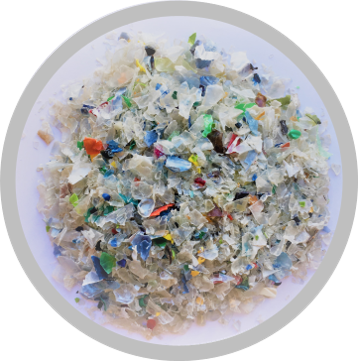 Our technology creates value by recycling mixed plastic streams directly into separated polymer groups with a purity of 99% in a single process step with a throughput of 1.5t/hr. 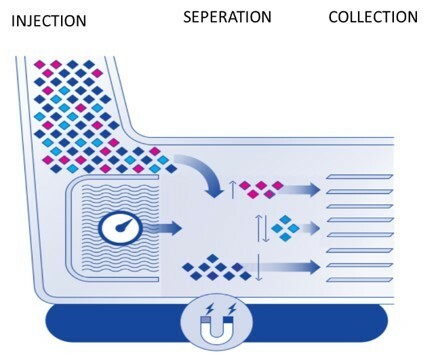 The Magnetic Density Separation (MDS) application, with a capacity of 10.000t/yr, makes use of specially designed magnets in combination with a unique water based process fluid to separate heterogeneous input flows on density levels of each individual particle in one step. The magneto-responsive fluid, also produced in-house, together with the permanent magnet, creates the required density gradient so that there are different densities at different heights in the machine. Particles flow through the density field, with light particles floating on the surface while heavier particles are suspended in the liquid below at different depths according to their density. The separation for the production of pure material fractions of equal densities is combined into one process by setting splitters in the right positions. 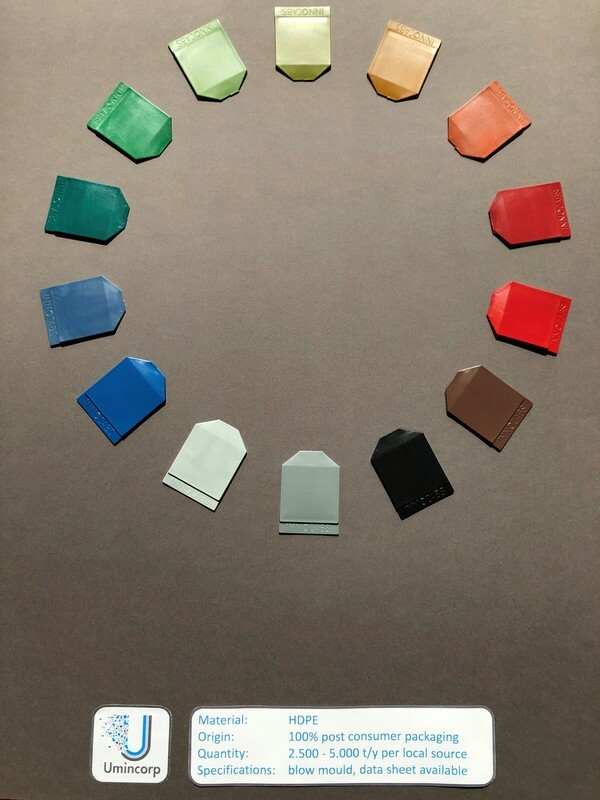 The use of MDS in the plastics industry results in high purity PP, HDPE, PS, PET, ABS, PVC or other plastics fractions that can be used directly in new high quality end products. We have the unique expertise to improve material recovery at higher product purity while reducing the cost compared to current alternatives. Using the MDS, the whole plastic chain can be made more efficient. An Umincorp plant receives plastic waste in object form directly from waste processors and municipalities. We use the Magnetic Density Separation technique to process this waste, but in addition we are realising shredding, washing and cutting processes before the materials enter the MDS installation. This enables savings on both transportation costs and CO2 emissions. The dropout rate - the percentage of plastic waste that is still unsuitable for reuse after processing - is also considerably lower than the 40 percent in conventional recycling processes. The total chain of plastics can be up to 75% more cost effective than current methods of recycling. The end product is of such quality and purity that it can be used as an alternative to virgin (new) plastic. The end product of our MDS is of such high quality and purity that it can be used as an alternative to virgin (new) plastic. 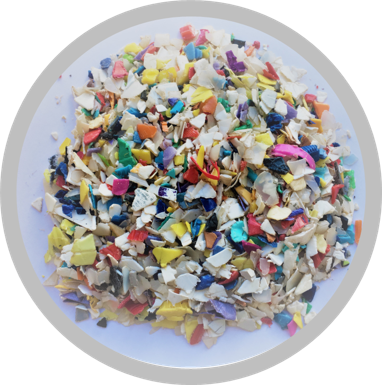 We sell flakes HDPE, PP, PS and PET to the market, so please contact us if you are interested. 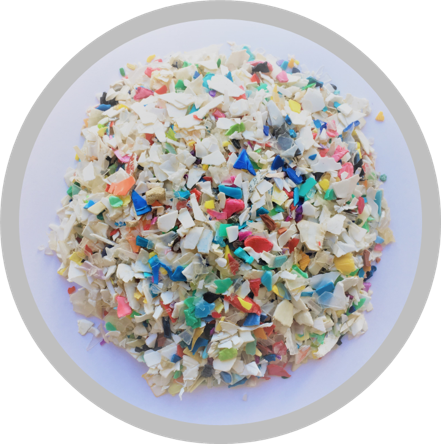 The high polymer purity of MDS sorted flake products enhances the consistency of rheological and mechanical properties over time. 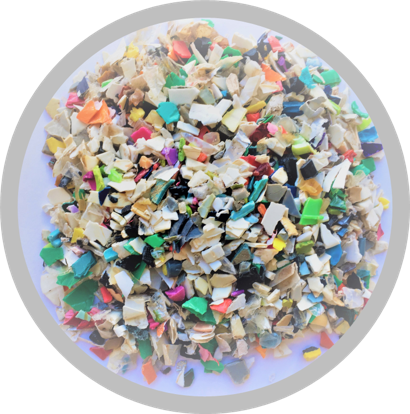 And based on cusomer requirements, we can convert the flakes to a wide variety of coloured compounds. Umincorp also produces its own Ferrofluid in-house, which is for sale. Please contact us if you are interested. Umincorp’s research and development program enables us to continuously improve our ability to convert complex material mixtures into high grade products. 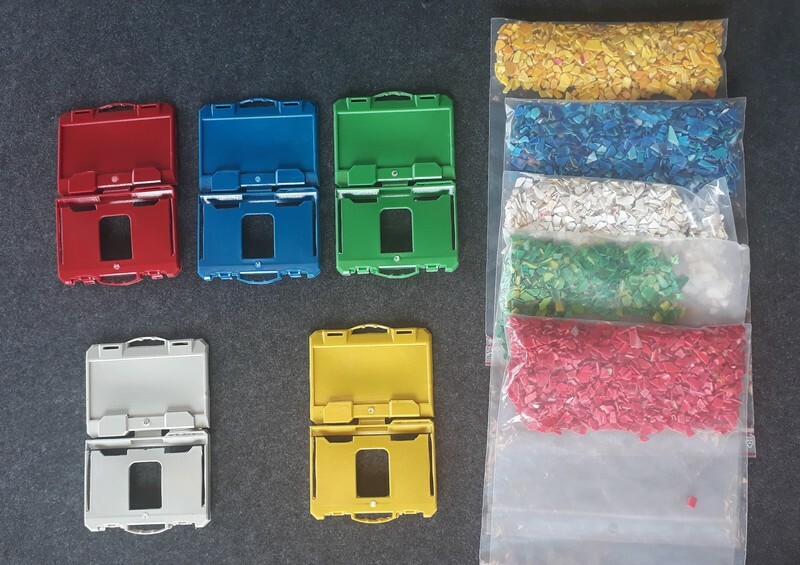 We are currently developing, in the field of packaging waste recycling, a high frequency color sorter for small polymer flakes. In the future, this will enable us to provide high product grades in terms of polymer type (e.g. PE) and to deliver on specific color requirements. 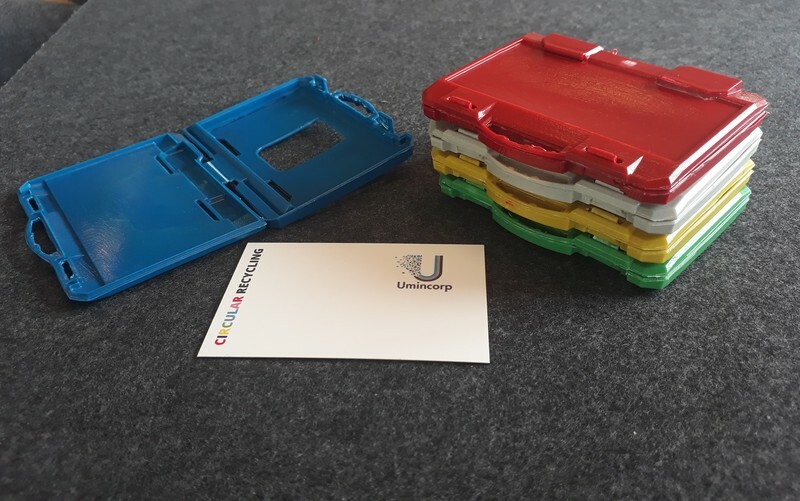 The business card holders/dispensors below are directly produced from colour sorted Umincorp PP flakes, without any additions or compounding. 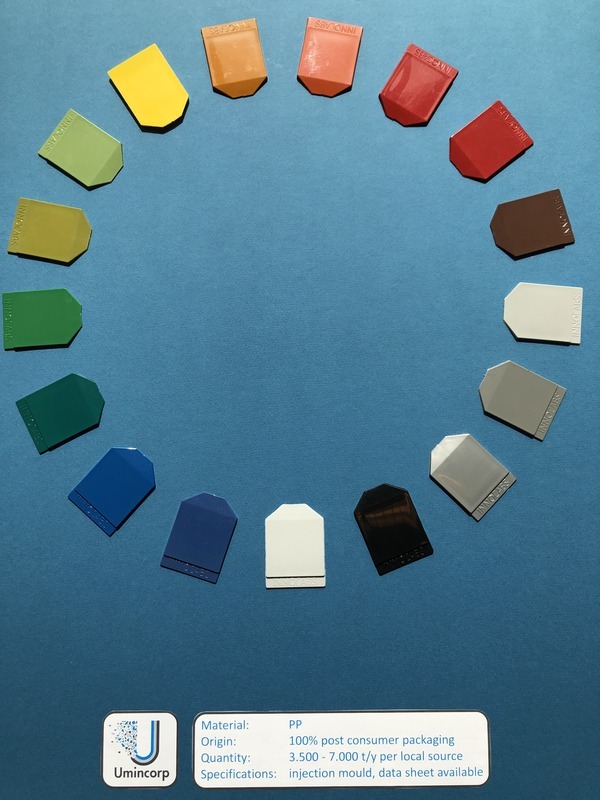 An example clearly showing the potential of low cost, high grade color sorting at flake level.